As I said in my last post , by the time we can detect a tumor — by the time it’s macroscopic — it’s already been through a long period of selection by the immune system. We see only the survivors of that selection, the cancers that have developed resistance to immune destruction. What happens to the other tumors, that have not yet escaped? Some of them are eliminated by the immune system. Rarely, if ever, do we observe this; it happens when there are a handful of pre-cancerous cells, a microscopic cluster of a few cells that have made a few steps toward outright carcinogenicity but are not detectable by almost any means we have available today. But if the “long period of selection” is accurate, then there is a third category; as well as those tumors that have escaped control by the immune system and those that are eliminated with it, there must be a set of tumors that are in equilibrium with the immune system. These equilibrium tumors, again, probably consist only of a handful of cells. The immune system recognizes them and destroys them, but because of some genetic or epigenetic changes in the tumor1 the fledgling tumor is not destroyed; neither can it grow out to be detectable, until at some point it develops further changes that allow it to escape immune control altogether. It’s quite likely that most of the tumors that we eventually see, spend most of their lifespan in the equilibrium stage. That’s the theory, anyway. As I mentioned last post, there’s more solid evidence for the “Elimination” and “Escape” stages, but there is some circumstantial evidence for “Equilibrium”. Now, a very recent paper by Robert Schreiber’s group looks at the equilibrium stage directly. The problem with testing the theory is (among other things) that the tumors in equilibrium are, pretty much by definition, undetectable. If they were detectable, we’d say they had escaped. What’s more, another part of the “equilibrium” definition is that it’s a long-term interaction. So not only must you detect the undetectable, you must do this over a long period. Koebell et al overcame this, at the cost of making the system more artificial, by treating mice with a low dose of a carcinogen. Some mice developed tumors, but eventually after a couple of hundred days new tumors stopped appearing. Many mice were still tumor-free. 2 The question then is this: Are those mice truly tumor-free, or so they actually have tiny, undetectable tumors that are in equilibrium with their immune systems? 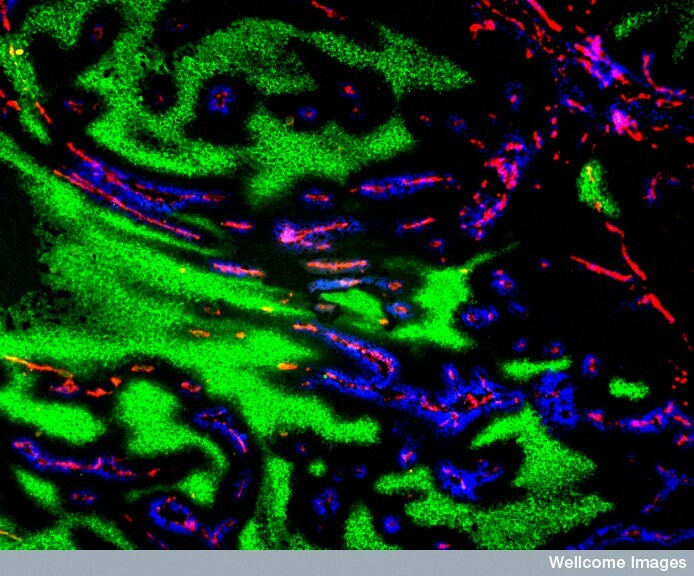 To test this, Koebell et al now shut down the immune systems of the tumor-free mice. Sure enough, tumors abruptly started to grow out in previously clean mice (the red traces in the figure to the right). This (along with some further controls I won’t go in to) argues that the mice were harboring tumors in equilibrium with the immune system. Knowing this, could these proto-tumors be detected? In fact, the sites of carcinogen injection often did have tiny, but non-progressing, lumps, a few millimeters around. I would guess that such tiny firm lumps would usually be dismissed as scar tissue from the injection, and so indeed some proved to be; but some of them turned out to look like cancerous cells. And these cells formed progressive tumors in immune-deficient mice — but not mice with an immune system; even though normal immune systems had not been able to eliminate them previously. 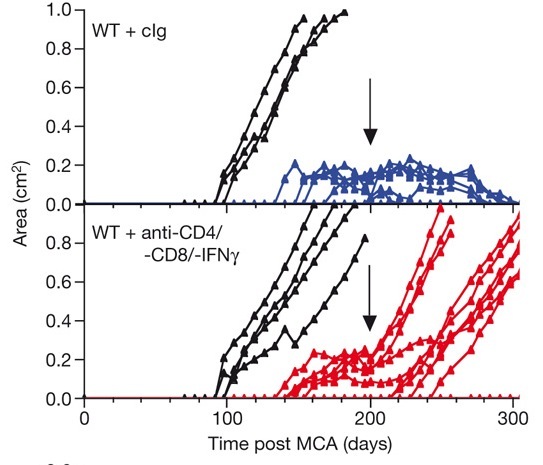 The paradox that stable masses from our MCA-treated immunocompetent mice often contained transformed cells but did not increase in size in vivo suggested that net tumour cell expansion was being immunologically restrained. We show that equilibrium is indeed a component of cancer immunoediting because tumour cells in equilibrium are highly immunogenic (unedited), whereas those spontaneously exiting equilibrium that become growing tumours have attenuated immunogenicity (edited)-results that place this process temporally between elimination and escape. This has lots of interesting implications. Are tumors in equilibrium potential targets for cancer prevention — say, cranking up immune responses to shift the balance toward elimination? Do tumors in equilibrium have some kind of molecular signature that will make their detection feasible in natural situations? Precisely what changes allow the tumors to progress from equilibrium to escape — and can those changes be targeted, to give the immune system a hand? This entry is filed under Cancer, Immune evasion, Immunology, Science. You can follow any responses to this entry through the RSS 2.0 feed. Both comments and pings are currently closed. If the cancer cells that are eventually detected are the ones that have survived their battle against the body’s immune system, it might be useful to investigate what within the immune system destroys the non-surviving cancer cells and find a way of increasing the ability of this to eradicate the surviving cancer cells. Gosh. Amazing theory, specially regarding the equilibrium stage. Thanks for sharing. It is simply amazing to believe that you can find that are in equilibrium with the immune system. It makes you understand how extremely complicated and complex is our body and our immune system. Thanks for sharing. A bit high-tech for me, but I got the point. Thanks for the information. I look forward to the day when our technology or methods allow us to detect cancer at a much earlier stage. It is amazing what our body can fight off, but as you say our immune system needs a hand. I just forward this blog to my wife, she is an oncology nurse in Australia. God, this is a very interesting topic… a bit deep for my limited info about cancer, but for sure my wife will love to read about this. I like the way you simplified the explanation of tumors we detect as the survivors of that selection… believe it or not some doctors are not capable of explaining as you did here… kudos to the author! I agree that this is one easy-to-grasp wisdom on tumors. More often than not, we’d get to posts that sound like they’re talking to fellow experts. It’s just so frustrating when all we want are the simplest explanations! Thanks for taking time to explain. You’re one “heroic” being for taking this difficult ground to us!